Research in the lab focuses on a variety of different neural engineering and neuroscience topics. In general, we seek to develop interfaces with the peripheral nervous system to restore function and to examine systems-level neurophysiology. Most of our projects fall under Neural Control over Autonomic Organs and Developing Neural Interfaces. We have active collaborations with researchers and clinicians within Electrical Engineering, Urology, Obstetrics & Gynecology, Surgery, Molecular & Integrative Physiology, Neurosurgery, and Biomedical Engineering, and we are developing collaborations with other groups within and outside the University of Michigan. The historical successes of cochlear implants and recent advances with retinal implants demonstrate the potential for neural engineering approaches to overcome neurological disorder or dysfunction. Functional electrical stimulation (FES) is one such approach, in which direct activation of nerves or muscles can generate limb movement or provide control over other bodily functions like bladder continence and micturition. Most FES projects are driving towards the primary objective of regaining function without focusing on secondary goals like movement efficiency. Ultimately, to regain natural control with FES, integration of sensory feedback will be essential. We are investigating the use of recordings from sensory nerves as feedback to improve upon FES approaches to restore function. We are studying the use of different decoding algorithms to turn these sensory nerve recordings into robust estimates of organ state. In the last twenty years, the use of penetrating microelectrodes arrays has yielded unprecedented amounts of data about the structure and function of the brain. Over time, research groups have used these arrays in the peripheral nervous system to stimulate nerves to control function or to record neural signals for feedback. 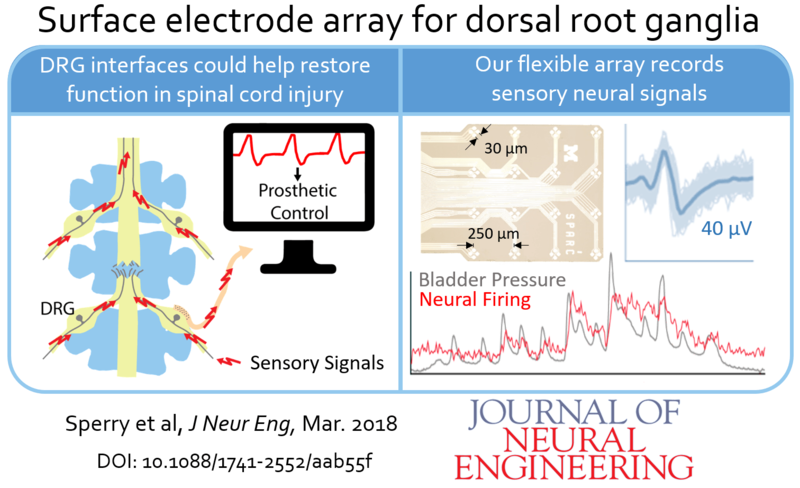 We are collaborating with electrical engineering researchers to develop and test novel electrodes that are designed for specific neural targets and that will promote improvements in signal stability and longevity over current approaches. 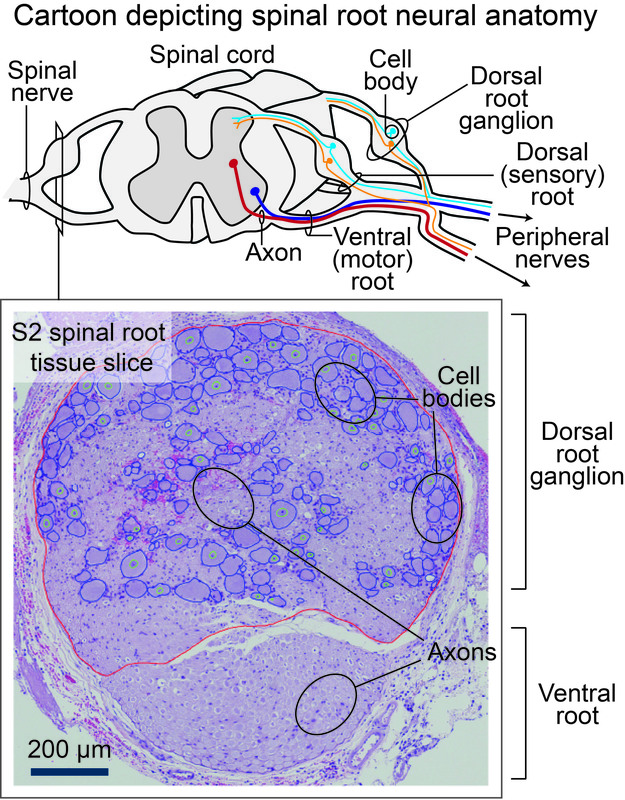 In particular we focus on dorsal root ganglia (DRG), unique structures in which the cell bodies of sensory peripheral neurons are packed together where multiple peripheral nerves converge together at the spinal cord. It is critical to understand the underlying anatomical structures when developing new electrode interfaces. We are quantifying the distribution of components for neural structures that are not well mapped. Dorsal root ganglia (DRG) are one such neural interface location for which the cellular distribution needs further study. We are analyzing histological samples towards building a model of DRG. Bladder control is a function that people tend to take for granted or are embarrassed to discuss. Unfortunately, inadequate bladder control affects a much larger proportion of the population than people realize, even with all the commercials for medications that are present in the media. Many elderly individuals and women after multiple pregnancies have inadequate control and must modify their lifestyle and/or attire. 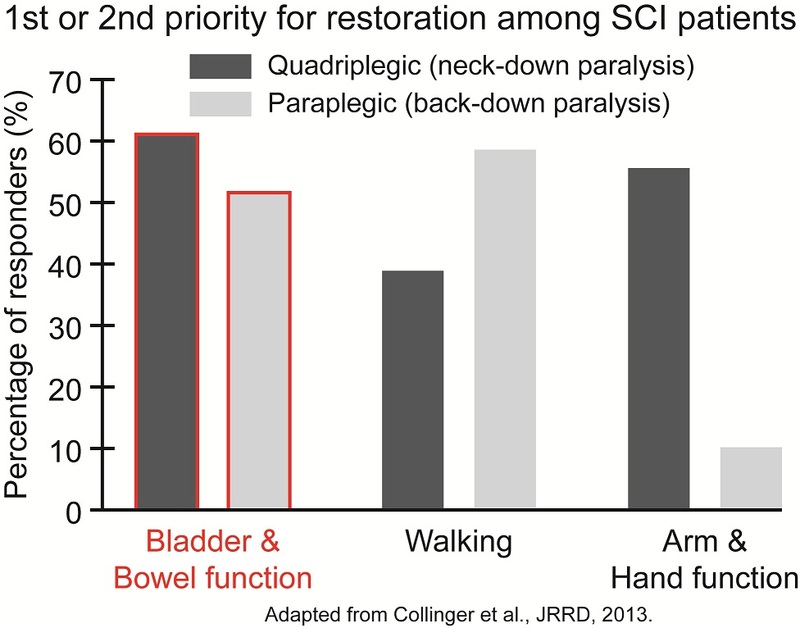 Up until the 1970s, insufficient bladder control led to the greatest number of complications for spinal cord injured patients. Today, improved bladder function remains one of the highest priorities for these patients and other groups with neurological disorders. Neural control of the bladder system is provided by a complex network of afferent reflexes and somatic, sympathetic and parasympathetic efferent nerves from which dysfunction can be manifested in a myriad of ways. We perform studies to understand how the lower urinary tract functions in normal and abnormal states and to investigate neural engineering approaches to restore control. Similar to bladder function, problems with sexual function are often embarrassing to discuss as well. While the use of drugs to assist men with erectile dysfunction is now common practice, treatment options for women are limited. A factor in this deficiency is the relative complexity of female sexual arousal, comprising both libido and peripheral arousal components that can be affected individually or together. Interestingly, many of the nerves that are involved with bladder function also have a role in genital sexual arousal. We are investigating neural control over arousal towards potential clinical neuromodulatory treatments and performing studies to examine the underlying mechanisms. We are also investigating neural control over other internal organs or functions. Recently we studied stimulation of renal nerves to modulate kidney filtration of glucose, which may have applications for people with diabetes. Below are some of the different technologies that we use in our research.